This is a sample starting Throne Room (using the Unfurnished §12,500 option) that grants the +40/- Beautifully Decorated buff in the main room. The upper floors are completely empty. The side rooms are very spartan, as shown. 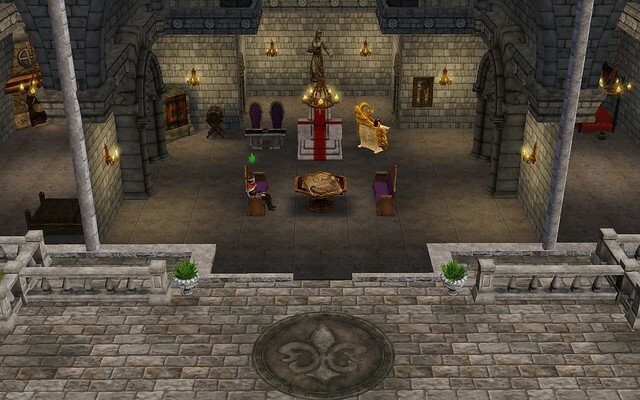 Basically, it encourages all AI sims to stay in the throne room for convenience if nothing else. Although we could probably have optimized it even further cost-wise, we still wanted an essentially functional and somewhat reasonable starting throne room. The marble table to the left of the throne doubles as serving table and guest table. The servant prepares food in the kitchen to the left, and since there isn't any table in there, he typically brings it out and tries to lay it on the marble table. Alternatively, the Monarch can grab food and drink from the Larder and Keg and sit down immediately. 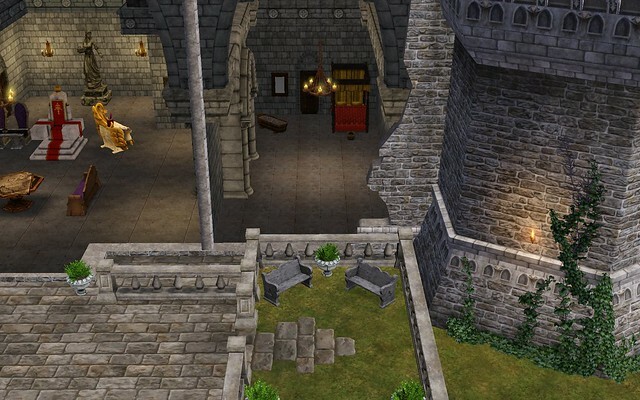 Once more funds become available, we might expand the kitchen properly and move all dining there if the Throne Room starts to become too busy with sims. For the moment, this is basically the only room in the castle. Guests can help themselves to food and drink, or entertain themselves listening to the NPC Bard that frequently comes here. Also, we choose high-Entertainment furnishings for the dining table and chairs, so that helped us get the Beautifully Decorated buff. Even the Larder adds an Entertainment bonus. Key to getting the +40/- Beautifully Decorated buff with our starting funds was getting a good Environment score for our simoles spent, which is why we went with wall lights. Floor torches were slightly cheaper but we wanted to save as much floor space as possible. Getting past +25/- Nicely Decorated required 2-3 items rated at Environment 7+, no matter how many Environment points were already in the room from other objects. Hence, we squeezed in one sculpture and one painting. The Monarch has just one indoor Responsibility that requires Focus: Writing a Treaty of Ongoing Peace. The only other Responsibility that uses Focus is Hunting a Great Bear, and that is outdoors and obviously would not benefit from the Throne Room's focus bonus. However, having a high Focus also increases your quest performance. Since you can spend a lot of time in the castle, staying in the Throne Room while having very high Focus can build your quest performance even if you have severely neglected your current quest; at the least, it can mitigate the penalty by slowing it down. Having a high Focus in the Throne Room also helps other heroes such as the Bard (performing for money) and Spy (pickpocketing). Notice the music box on the marble dining table. Sims very frequently beeline for it to turn it on, which provides not only a Listening to Music buff but also an Entertained buff. The radius of the Listening to Music buff is quite small, so we have placed it quite close to the centre of activity. This very spare kitchen can be expanded later once we can get more furnishings for the Throne room and move the dining activity here. For convenience, however, we will probably still want a keg in the Throne Room for a quick drink to boost Focus. We could run to the kitchen, but every time you move into an area where the bonus for Decoration changes, the bonus completely disappears for a while. The same applies when you place or remove furnishings and trigger a change in the Decoration bonus calculated by the game. The Servant in the castle randomly prepares various types of meals -- even with the possibility of whale meat as an ingredient. For this reason, we got the FrostStone Larder right away. Typically you can call for one meal, and when it arrives, call for another immediately. Eat one, stash the rest in the Larder just in case you come back to the castle at an odd hour and the Servant cannot be called. What used to be the strategy room and office has now become the bedroom / ready room. We got a really good bed and left upgrading the bathtub and mirror for later. The mirror could also be moved to the main Throne Room for quickly Gussying Up. 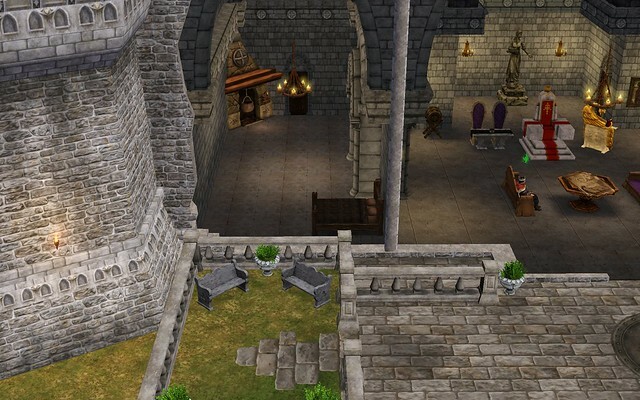 Once the Spy becomes available, we will probably ignore their spy quarters and instead move them to a room upstairs simply to shorten travel time and to take advantage of the castle's kitchen and larder. The Monarch would have to pay for all furnishings, however, and a good bed can be pretty costly.